Worcestershire Archive and Archaeology Service (WAAS), in partnership with Museums Worcestershire, has been successful in its bid for £74,900 from the Heritage Lottery Fund (HLF) to bring the Lost Landscapes of Worcestershire back to life. Over the next 18 months staff at WAAS and the Museum will be delivering events and exhibitions celebrating over half a million years of the area’s prehistory, from the time our ancestors arrived until the end of the last Ice Age 10,000 years ago. The first people to live in the area now called Worcestershire arrived at least half a million years ago, as the ice sheets receded northward and the climate warmed. They slowly worked their way up river corridors from central Europe as the animals they hunted migrated northwards. Remains of their tools and dwelling-places from across Europe show that they had sophisticated cultures. These first people didn’t stay, they came and went with the warming and cooling of the climate over the next few hundred thousand years, retreating into Europe as glaciers covered much of Britain and returning in warmer periods. Various species of animals came and went during these periods too, and their remains lie in the gravels and sands beneath our feet. It is incredible to see a 2 metre long mammoth tusk exposed by a mechanical excavator, and to imagine that animal once roamed an icy Siberia-like tundra where now people eat burgers and fill up with fuel on their ‘migrations’ up and down the M5. Working with volunteers, local schools and the public, we will explore our understanding of the Ice Age objects and information in the care of WAAS and Museums Worcestershire as well as the collections of institutions across the West Midlands. 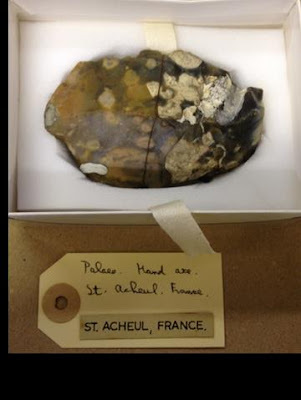 Worcestershire’s collections, amassed since the 1830s, tell a story of antiquarian study and a developing understanding of the most remote of periods in human history. 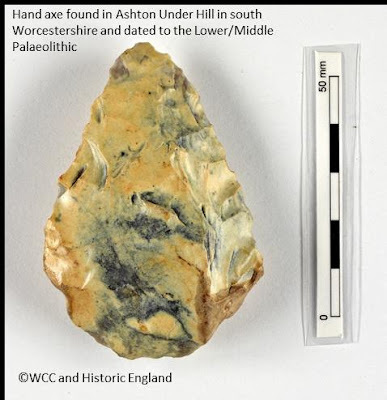 Wonderful objects were collected both from within Worcestershire and from key Ice Age sites in Britain and Europe throughout the 19th and 20th centuries. Exhibitions and activities will bring together what we know of Worcestershire’s lost Ice Age landscapes from two centuries of collecting and study, and examine the consequences this had for the ferocious debate surrounding the origin of our species and what it means to be human. The impact of these exotic arrivals must have been revelatory. This exhibition will explore the cultural context of their acquisition and understanding. Set against the back drop of Darwin’s Origin of Species and the emergence of our understanding of evolution and the antiquity of humankind, the story of how 19th century collectors acquired, shared and discussed these extraordinary specimens that spoke of distant aeons, is the story of how we understand what it means to be human. Regular updates will detail how the exhibition comes into being from the very start until the doors open, with all the behind the scenes work that culminates in a museum exhibition. Starting with the background to the project and information about the Worcestershire museum collection, the blog posts will follow the journey the project takes as we put the materials together and learn more about the collection and the County’s past. For more details about our mammoth discovery you can read our blog post here.